When you’re a beginner, you have so many goals. To get stronger, run faster, run for longer, be more flexible, lose body fat, increase energy, row faster, get better at Kettlebell skills, finally get that handstand in yoga, and more. The joy of just starting out (aka Newbie Gains): you’ll be able to make progress in all of these areas. As a beginner, simply getting stronger will also help you increase your endurance. Running more will likely help with flexibility. Your improved flexibility and strength will boost your speed. Practice will help you refine your Kettlebell skills and asanas. But once you’re past the beginner stage, you will start to flounder if you try to get better at doing a bunch of random stuff all at once. Choose one specific fitness goal to pursue at a time, and take 4 to 12 weeks with a specific plan to augment that fitness characteristic. If you (like most athletes) want to improve across all fitness characteristics, it can be hard to decide what to focus on first. Out of the basic fitness categories, what you choose will come down to personal preference. But it’s helpful to keep in mind that some fitness characteristics will help you accomplish other characteristics at certain stages of fitness. So it’s often best to start with what will stick around the longest. Strength takes a long time to acquire, because an improvement in strength is part skill acquisition and part putting down new tissue. But while strength costs the body a lot from a metabolic standpoint, it will stay with you longer once you move on to pursuing other characteristics because of the initial investment. On the other hand, you can affect your conditioning pretty quickly. But once you move on to another trait, that progress will quickly diminish. That’s why I usually recommend picking a strength goal first—because it will give you a bigger engine. With this bigger engine you can push harder and make better strides when you switch to conditioning goals. Once you’ve decided on prioritizing a strength goal, what strength move should you pick? If you’re still trying to improve across all the different fitness categories, then you want to pick a strength goal that will support other goals. For example, the overhead press is a great strength move, and something that should be part of a well-rounded athlete’s tool kit (barring any injuries/impairments). However, that specific movement doesn’t have as much carryover as other strength moves. Better choices would be a deadlift or squat—something that lets you move a significant amount of weight, and involves a greater proportion of the body. Both the squat and the deadlift are also lower-body movements, which is beneficial because many other fitness characteristics will be lower-body driven. Running (a dominant method of testing and training conditioning) is obviously a lower body movement. So increasing your lower-body strength has the potential to carry over into other systems. Another reason to pick a strength goal first: once you progress to moving a high percentage of your bodyweight (100% or more of bodyweight), you’ll see other benefits to your overall physical fitness. Being able to move a significant load affects the nervous system differently. A heavy deadlift will have a great impact on improving your grip. 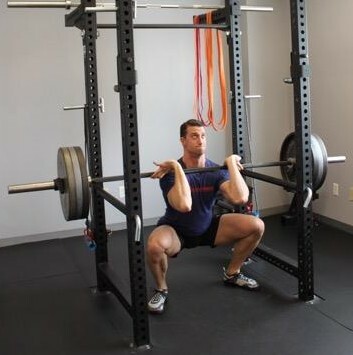 A heavy squat will be more demanding on the anterior chain (everyone’s favorite: abs). So when focusing on strength, you need to have a plan of progressive overload. If you choose to specialize, you’ll prioritize your chosen fitness characteristic—even at the expense of other characteristics. You’ll make progress, but when you focus on one goal on the fitness continuum, then the other end of the spectrum will suffer temporarily. It’s also okay to pursue more than one strength move at a time, but one will be more important than the other. If you choose not to specialize, as you move from goal to goal, you’ll inevitably take two steps forward and one back when you switch to another characteristic. Neither approach is necessarily better than the other—it’s all a choice. Note that I said other fitness characteristics will suffer temporarily—not permanently. You can still choose to progress in all fitness categories, but you’ll have to move from single category to single category rather than making multiple advances simultaneously. It may feel frustratingly slow occasionally, but you’ll see the best results when you improve at one thing at a time. As long as you’re making global progress, it’s okay—your whole system is getting more robust and more efficient.